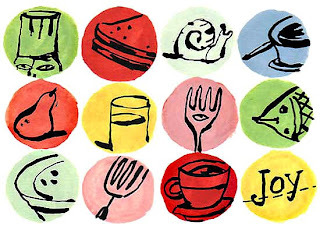 I did this art to accompany an essay I wrote for Leite's Culinaria, a tasty food website out of New York. I also used this dot style for my book cover. (See right) The gist and anecdotes of the essay came from the book as well. In essence: we eat and drink with people we know and love and we live another year. It's a survival behavior. I practice it religiously.